The statue of Our Lady of the Miraculous Medal dominates the Germantown, Philadelphia, shrine to Mary. More than 10,000 people are expected to come through the doors to pray for those they love and care for during the Solemn Novena liturgies Nov. 17 to 25 at the Miraculous Medal Shrine at 500 East Chelten Avenue in Philadelphia’s Germantown section. On Wednesday, Nov. 26, the feast day Mass in honor of Our Lady of the Miraculous Medal will be celebrated by Bishop Raymond Chappetto, Auxiliary Bishop of Brooklyn, at the 10 a.m. Mass. Prayer intentions for the Solemn Novena to be placed at the altar for the nine days may be offered at the website www.MiraculousMedal.org. Live video of the liturgies will be streamed online at the website each day at 9 a.m. and 12:05 p.m. All the days’ homilies will be posted on the website and on Facebook at Mary’s Miraculous Medal Family page each day. Visitors are invited to meet Diana von Glahn, producer and host of EWTN’s “The Faithful Traveler,” who will be selling and signing her DVDs in the lower level of the shrine before, during and after all novena Masses. The Miraculous Medal was shown to St. Catherine Labouré by the Blessed Mother during her third visitation. Billions of people worldwide wear this medal today and receive many miracles. The full history of the Miraculous Medal and Miraculous Medal Shrine can be found online at www.MiraculousMedal.org. 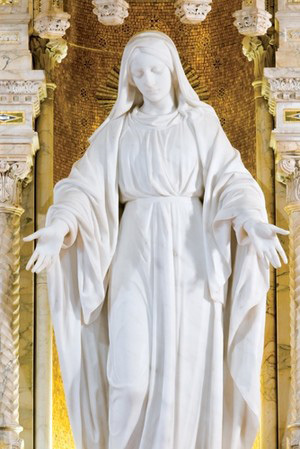 The Central Association of the Miraculous Medal is a Catholic non-profit organization that was established in 1915 by the Congregation of the Mission, an order of priests founded by St. Vincent de Paul, popularly known as the Vincentians. The Miraculous Medal Shrine was built in 1927 to help spread the devotion to Our Lady of the Miraculous Medal and to support the mission work of the Vincentian priests and brothers on behalf of those most in need.